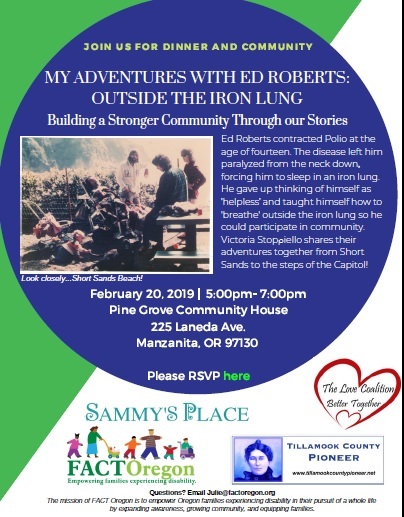 Join us for the inaugural event of Building a Stronger Community through Our Stories – North Coast Stronger Together Series – hear from a local icon, Victoria Stoppiello about a national activist, Ed Roberts on Wednesday, February 20, 5pm – 7pm, Pine Grove Community House, 225 Laneda Ave., Manzanita. 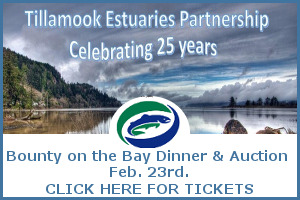 The event includes dinner and is FREE to everyone. Registration is required, so we can prepare the meal. See below for link to RSVP. Ed Roberts contracted polio at age of fourteen which paralyzed him from the neck down. He spent his remaining years relying on the iron lung at night to breathe. For those unfamiliar with the iron lung, it is a large sealed, now nearly obsolete, chamber that provides oscillating atmospheric pressure to create breathing in someone who has lost muscle control of their lungs. 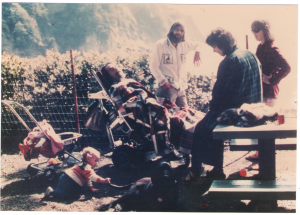 Come and hear from local, Victoria Stoppiello, a close friend to Ed Roberts, how he became the nation’s leading activist and advocate for disability rights – civil rights – in the 1970’s and ‘80’s. Hear of his road trips and adventures that include visits to our own Short Sands Beach and on to the steps of the Capitol! You are invited to an evening of dinner and storytelling, wrapping up with dessert ‘n discussion. Often times our differences create unrest. Through our own local stories of adventure, we can discover we share similar struggles and can build support when uniting our efforts. ‘My Adventures with Ed Roberts’ kicks off a North Coast series of building a stronger community through our stories. Everyone is invited and welcome. Please RSVP at www.factoregon.org. Supports come from: FACT Oregon, Sammy’s Place, Tillamook County Pioneer and The Love Coalition.